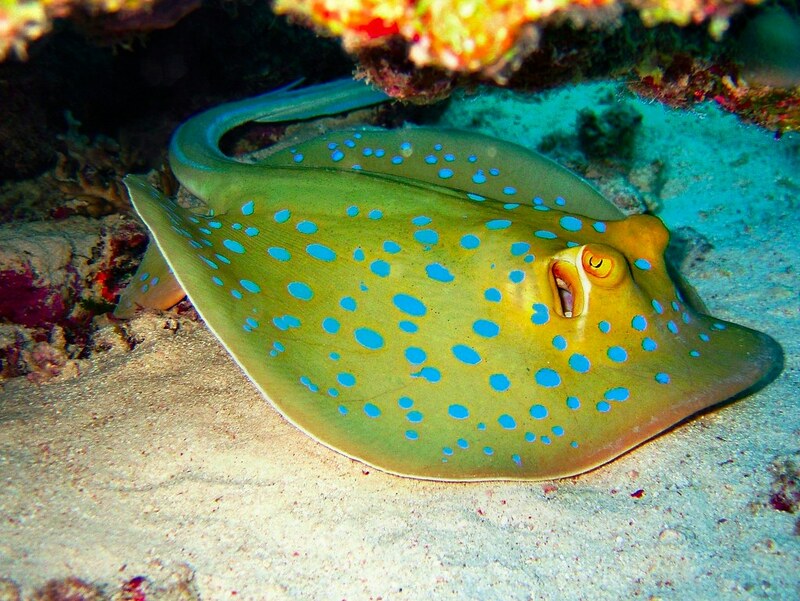 The blue spotted ray, also known as the blue spotted ribbontail ray, belongs in the Dasyatidae family. This wonderful creature can be found living near the bottom of warm waters in the Indo-West Pacific region. Unlike most rays, it rarely buries itself under the sand. Below are more interesting and fun facts about the blue spotted ray. As named, this ray has beautiful blue spots on the top part of its body. The spots are warning signs to other sea creatures, telling them it is poisonous and can cause harm if messed with. Along with its dark coloration on top, normally a yellowish-olive color, it makes the perfect camouflage to those that swim above him. In addition, its white underside helps camouflage him from those below. Its length, including its tail with blue stripes on each side, can reach up to 28 inches. The tail, which is roughly 1 1/2 times the size of the body, has one or two (normally two) venomous spines, which fend off predators. Its yellow eyes, located on the upper part of the body, can almost see what is behind him. Above each eye are spiracles which allow the ray to breathe. Blue spotted rays are bottom-dwelling creatures that can be found living alone or in small groups around coral reefs. Rarely are they seen in waters deeper than 66 feet. The blue spotted ray is considered shy and will normally swim away when approached by humans. However, if it feels threatened, it will strike and release its venom. The venom can cause much pain, but normally it is not fatal. Its mouth, which is located on its underside, has many small "teeth" that are arranged in plates and are designed to crush its victim. The ray can capture its prey by pinning it down with its wing-like fins or by scooping up those that hide in the sand. Normally, they eat during the day. Prey includes small fish, worms, shrimp, mollusks and crabs. The blue spotted ray is ovoviviparous, meaning the mother gives birth to live babies known as pups (the eggs hatch inside the mother's uterus). It is believed the gestation period lasts between 4 to 12 months. The mother can have up to seven pups that resemble a small version of the adult ray. One known predator of the blue spotted ray is the hammerhead shark. It can avoid the ray's poisonous spines by pinning it down to the ground. Other possible predators include other sharks and large fish. 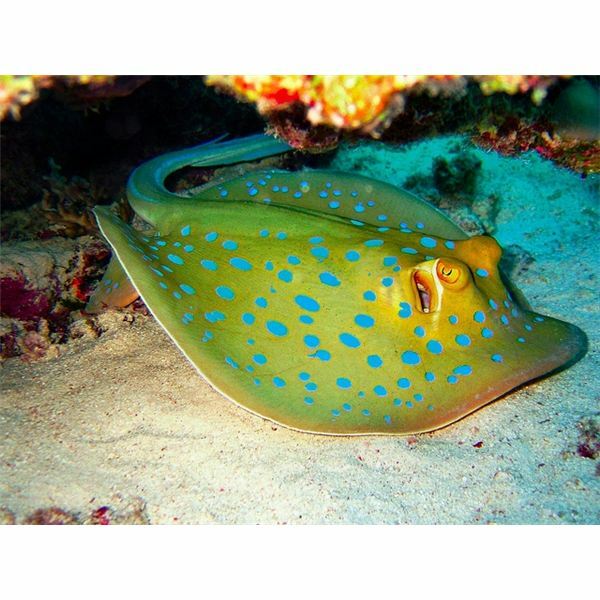 Although the ray is classified as stable, and it is widely distributed, it is subject to a decrease in population because of coral reefs being destroyed, and it is often captured for aquarium fish trade. The blue spotted ray should not be kept as a pet. They often outgrow home aquariums and most do not do well in captivity. • Because the ray's tail is longer than its body, it can strike its prey directly in front of him. • The ray will often go to a cleaning station to be groomed. This is an area where shrimp and tiny fish pick off dead skin and bacteria from the body of rays as well as large fish. 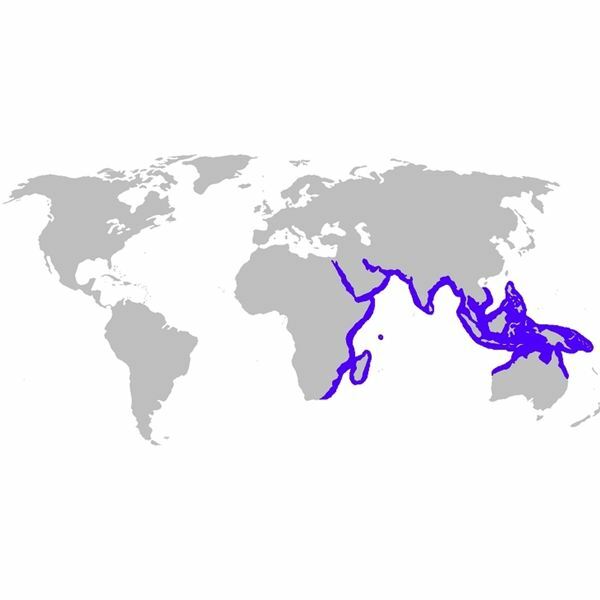 • The lifespan of a blue spotted ray has not yet been established.